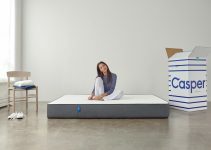 There are a vast amount of brands that manufacture and sell air mattresses, and each has its unique features to make your decision even harder. It's also likely that you don't have a lot of time to make this decision which makes a choice even more difficult. On the other hand, if you're looking to replace your existing worn mattress, it's likely that you're noticing an abundance of new brands on the market. To make your buying decision easy, we have created this detailed air bed review guide including all the essential issues you need to consider to help you understand the industry and ultimately buy the best air bed mattress. Intex has designed and manufactured this ultra plush air bed which has set the bar high within the air bed industry with this market leading product — made from waterproof material with a flocked outer sleeping surface for added comfort. Each mattress is supplied with a built-in pump which allows you to inflate and deflate with ease. Built in pump that allows you to inflate and deflate in just 4 minutes. Constructed using the highest quality materials to give a you comfy sleep. Due to its size it can easily accommodate 2-3 people at once. Looking at this beautifully crafted air bed, it's easy to see why some purchasers have decided to use this as their permanent bed. In terms of air beds in the UK is in the top range so you won't be disappointed. The Intex is the best air bed mattress available. Intex is a well-established brand in the outdoors and camping market, and have created a range of air beds that are perfect for outdoor pursuits and indoors. This twin size air bed has a built-in pillow for added comfort and an integrated electric pump so you can inflate it with ease. The top side of the mattress is finished off with a velvet material for added support. Built in electric pump that both inflates and deflates the mattress rapidly. Finished off with a velvet material to provide the comfiest sleep. Overall the Intex mattress is extremely versatile and useful in a range of situations while providing a top class sleep. It is also extremely affordable and long lasting so if you purchase you can be sure that you're making a worthwhile investment. Coleman is an extremely popular camping and outdoor brand and manufactures a range of different goods to improve your outdoor experience, and there is no difference with this double air bed mattress. Each half of the bed features separate air chambers which allow each user to choose their level of firmness. The blow-up bed has a built-in coil structure which helps to support and comfort your body during your sleep meaning you'll wake up in the morning feeling refreshed. Airtight system with integrated double lock valves to retain air. Environmentally friendly and phthalate-free which ensure there is no plasticisers present. This eco-friendly air bed is value for money; the only downside is that it requires an external pump, unlike its competitors. Because of its valve technology, if two people are sleeping on the bed, they will not roll together. This is a superb mattress for both indoor and outdoor use. This well designed Aerobed Mattress can go from its carry bag to blow up bed in under 1 minute. It includes a built-in powerful pump which plugs into a mains power for both rapid inflation and deflation. When the airbed is not being used it conveniently can be stored in its included carry bag which is perfect when space is limited. It's perfect if you have guests visiting or need a temporary bed. It is manufactured to have an inbuilt coil system to provide a more secure and comfortable sleep while releasing pressure on the back and shoulders. Inbuilt mains pump for easy inflation and deflation. Non-allergenic material to provide a dust mite free sleeping surface. You can't go wrong with this air bed mattress especially due to its built-in coil system to give you the comfiest nights sleep while its carry bag makes it easy to store away when not in use. UK Hobby Store presents an Airbed & Electric AirPump bundle that comes in a range of sizes and colours. The external electric pump can be powered by either mains house socket or a car outlet. The pump allows for rapid inflation and deflation and is made from high quality flocked waterproof material which provides added comfort, so it is ideal for both camping outdoor or simply for house guests. Coil structure to provide support and comfort. Can be easily rolled up, perfect for storage. While this mattress does provide a comfortable sleep; it does use an external pump which can cause problems if you misplace it. It also requires you to transport more things if using it for camping, when we know space is at a premium. Also known as a blow-up mattress or inflatable bed, they are mattresses made from PVC that can be filled full of air instead of the traditional memory foam, springs or latex materials. Blow up beds have developed significantly over the years, it was only several years ago that you had to pump them up manually with a hand pump , but now some mattresses come complete with electric powered pumps. It is common for people to swear by blow up mattresses because they give you the ability to accurately alter the level of firmness which is perfect if you suffer from back pain issues. Air bed mattresses are made in a range of different sizes and shapes starting at small and increasing up to King size. Blow up beds can now be purchased alongside a set of portable metal stands that hoist the mattress above the ground. This is ideal if you plan on using the mattress on hardwood flooring as the cold from the ground can transfer on to the mattress. Also, the mattress can slide on surfaces such as hardwood flooring if there are low amounts of friction. Some frames are supplied with accompanying rails commonly made of foam. If you plan on using your air bed frequently, then we highly recommend purchasing a mattress with a built-in electric pump. Manual pumps are perfectly useable; however, it takes more time, and if you use the mattress often it can become a pain having to blow it up manually continually. If you plan to use the mattress outdoors for camping trips, then you may have to inflate many beds, so an electric pump is even more ideal. Built-in pumps are naturally fairly noisy, however, when buying you should specifically look for models with a high output. External mattress pumps are much more traditional. They can range from being manually operated by foot/hand or be powered by mains/battery. Air mattresses with external pumps are usually more affordable than blow up beds with built-in pumps. External pump mattresses are slowly being phased out of the market as technology begins to progress. If you do decide to purchase an external pump mattress, you must be aware that if you misplace the pump, then you'll need to buy a replacement. Air mattresses with a lower profile do not have the foundation base which makes them more affordable, compact and easier to transport. This is especially suitable if you plan on using it for camping trips as they can be easily inflated, deflated, rolled up and stored. The low raised air mattress is ideal for children to sleep on as they will be closer to the ground. The most common air bed in the market is the raised thickness mattress which usually is around the same height as a traditional bed. This is created by manufacturing an inflatable mattress which is connected to its foundation base. This gives the consumer a more relatable experience as it resembles a regular bed. Also because they're larger in depth, they are more sturdy and offer a more stable sleep with a decreased chance of the mattress moving throughout the night. Can be easily inflated and deflated, but it can also be used as a permananet long term bed. Can make a camping trip significantly more comfortable in comparison to using a traditional sleeping bag. Although slightly more uncommon, air mattresses are used as a permanent bed. So they are not deflated and packed away after each use, but are left out and used each night to sleep on. If you do plan to do this, we would recommend you spend a little more on a higher quality mattress and in a larger size of either Queen or King. If you plan to use an air bed mattress, you may want to buy some accompanying stands to store the mattress on. An airbed is a great temporary solution for events such as children's sleepovers or if you have a house guest staying the night. The nature of an air bed means it is compact and portable and is more comfortable than alternatives such as sleeping on a lumpy sofa or hard floor in a sleeping bag. If you purchase an air mattress for temporary use, it'll most likely last many years if you pack it away when it's not in use. One of the most common uses of an inflated air bed is for camping. If you plan to take a trip into the wilderness, then it's highly likely that you will bring sleeping equipment with you. Traditionally the majority of people would have bought and used a sleeping bag. However times have changed, and there are now more comfortable alternatives such as an air bed. Because they come in varying sizes, you will always be able to find one that can fit inside your tent. A great benefit is that once you wake up in the morning, it can easily be deflated and stored away. If you're planning an extended period of travel or you frequently visit park resorts where you stay in a camper van, then an inflatable mattress is a suitable solution. It's a great way of getting a great sleep while sleeping in unfamiliar surroundings. They can come with stands however space will usually be limited in the back of a car or camper van so it would be wise not to use them. Air mattresses usually fit snugly into the back seat which hugely minimises the amount of sliding the mattress can do. Congratulations on making it to the end of the guide, because now you have all the knowledge you need to go out and buy an air bed that is most suitable for you. No matter your requirements there is a mattress out there for you whether you need it for multiple people, single people, temporary use, permanent use, for adults, for children, indoor use or outdoor use. if you want to buy a regular mattress, discover our top picks here.